After major structural changes in AEM 6.4 last year, Adobe has finally rolled out its new version Adobe Experience Manager 6.5 on . Like Adobe Experience Manager 6.4 there are not any major structural changes in AEM 6.5. Adobe Experience Manager 6.5 mostly focuses on enhancements, stability and some really cool enhancements. 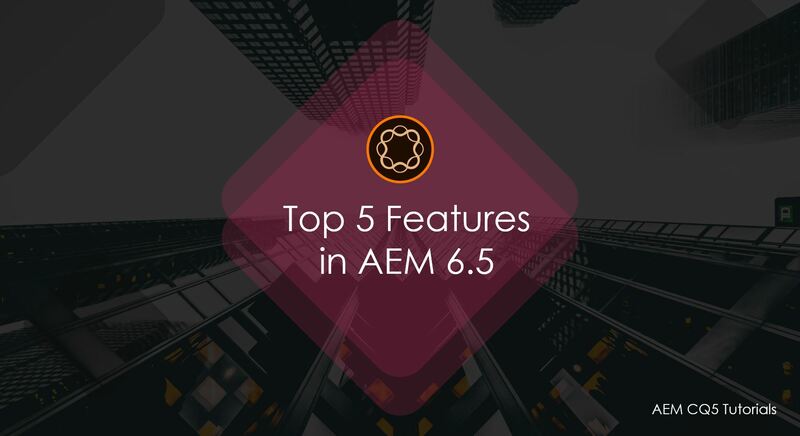 There are many enhancements that are added to aem 6.5 like support for Java 11 , Core component enhancements, User experience Enhancements etc .Out of these enhancements my personal top 5 features/enhancements that are introduced in AEM 6.5 are below. This one is my personal favorite and is on top priority list of Adobe core team as many customers has requested for this feature. As this solves a very common use case where customers have a central DAM and want to keep their sites implementation separate. Remote Dam with AEM asset allows Sites Author to login to Remote DAM from the Content Finder panel in Page Editor and search or drag & drop assets from remote dam instance. We will see more details about it in my next article about connected DAM in AEM. Till AEM 6.4 it was not possible to check whether current experience fragment is currently in use by any activity on target or not. As part of this enhancement, if the Experience Fragment is currently in use by any activity in Target, an error message will warn the AEM user about consequences that deleting the fragment will have on the activity. If the Experience Fragment is not being used by any activity, AEM allows the user to delete the fragment without a message. Allowing Export of Experience Fragments to Target in HTML format, JSON format or both. This will be really helpful when target is being used with SPA Application Scenario. As an SPA application might need to fetch offers from target in JSON format. AEM 6.5 now support Full Text search for Experience Fragments. Content authors who were authoring content fragment was very eagerly waiting for support of version compare/differences ad annotations from very long to get better control over content change and have better visibility. AEM 6.5 content fragments now supports version compare where content authors can check what are the recent changes made and can compare across different versions. After acquiring Magento last year many customers are waiting for this out of the box integration. This integration is made possible by using Adobe I/O runtime. In adobe i/o runtime customers can create their own custom microservices, which can be consumed by any Adobe or 3rd party solutions. AEM 6.5 is shipped with many pre built api connectors for magento. Apart from it AEM 6.5 is shipped with updated We.retail template with commerce components to understand magento integration better. Apart from above features their is much more which is getting shipped with AEM 6.5 like many AEM Forms Enhancements , Adobe Asset Link – creative cloud integration with AEM, Enhanced Metadata Support, introduction to Visual search support for assets using adobe sensie etc.